Little White Daisies . . . Yet another (primarily) white wildflower came into my field of study over the past two weeks: a little white daisy carried on long stems bristling with tiny alternating leaves. Open any wildflower reference using these details as a guide and the result is overwhelming: not several, not dozens, but hundreds of possibilities. 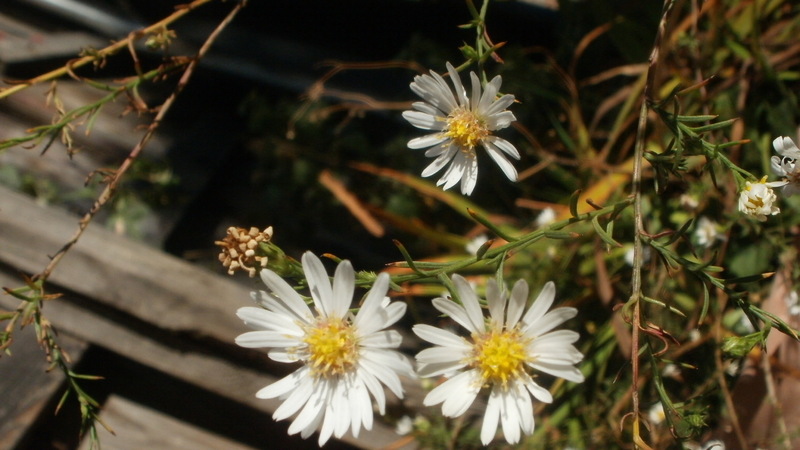 The little white daisies one encounters in the autumn are all members of that expansive family, Asteraceae, but there are immigrants, the Fleabanes, and natives, many of which reside specifically in the house of Aster. There are over 290 varieties of Aster growing in the United States, and determining one from the other often comes down to counting petals or other minor details of stem or leaf. So it was with the specimens pictured, which after lengthy investigation I have determined to be Calico Aster, Symphyotrichum lateriflorum. 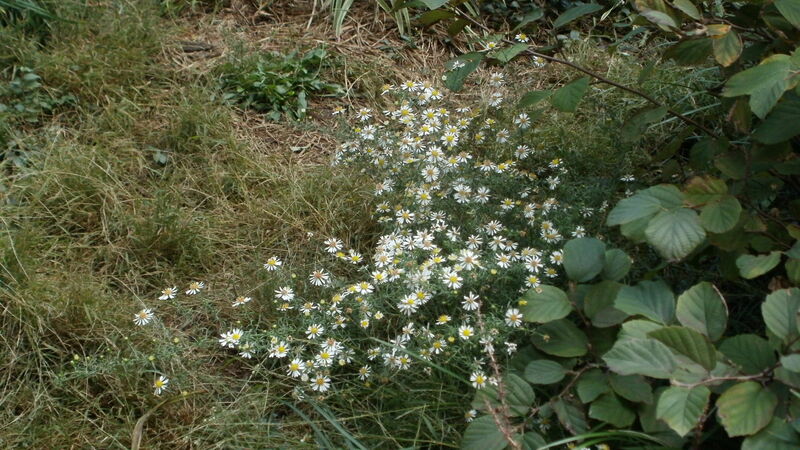 Described as a “variable species” (an understatement), the Calico Aster is an autumnal perennial, can bloom white or pinkish, and the flowers can be sparse on the stem, or tightly packed. The ones I have found fall under the former list of descriptions: bows of sparse, little white daisies supported by a smooth, somewhat woody main stem two to four feet in height. The individual blooms consist of an egg yolk yellow disk surrounded by approximately two dozen white rays. Two key details helped me to pinpoint this particular identification. The first was found in the leaf – narrow, pointed, almost like a pine needle – and the alternating pattern along the stem, which resembles Rosemary to my eyes. 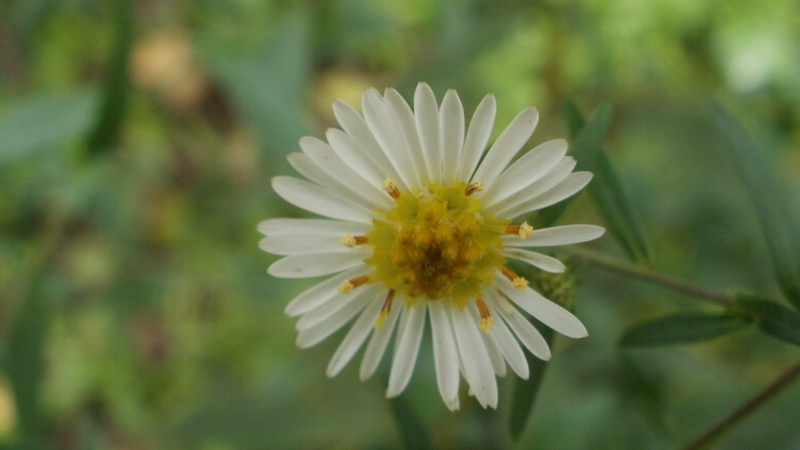 Many of the other Aster and Fleabane varieties have more ovate toothed leaves like the cultivated garden daisy. The other clue was found in the central disk of the flower; it changes color as it ages. Younger blooms resemble an egg yolk, sunny side up, while older ones turn the color of tarnished gold. The Calico Aster, true to its name, displays these different shades at the same time. Symphyotrichum lateriflorum is also known as Frost Aster, a poetic name, one that fits like a mitten as the chill of November nights begins to hover around the freezing point.